In any case, using both WCF REST services and MVC-style web services are both quite convenient – and you don't have to choose. You can use both. In fact, you can use both inside the same web application project. However, a recent question on StackOverflow illustrates that you have to be careful how you set up your routing in order to make WCF REST services work inside MVC applications. The resulting URL being produced was: "/Person?action=Index&controller=Home" which was clearly not correct. It's hitting the first route and thinking it should just put "Person" for the first segment. 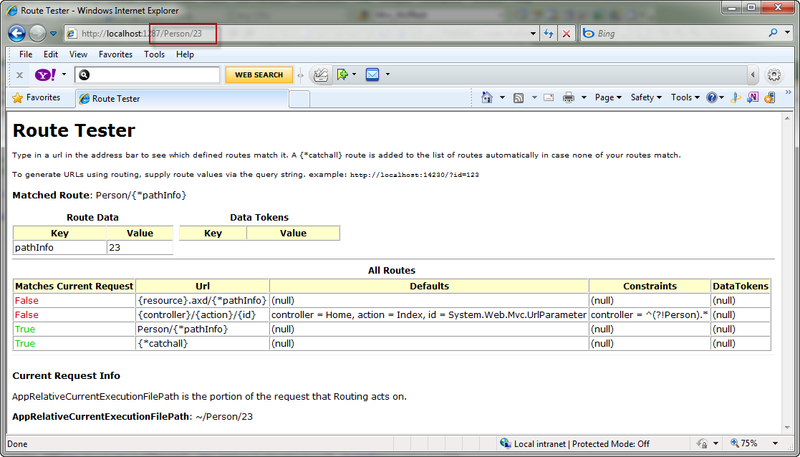 It then cannot match the "controller" or "action" tokens so it just puts them in the query string. It will attempt to go to the service but the URI is incorrect so, if it's a WCF REST service, you'll just get the default help page. Of course, we know that the order matters for routing so what if we put the MVC route first and the service route second? In this case, we run into a different problem. If the first URI segment is "Person" then it will try to match that as the controller name and you'll get a 404 or, if you're using a controller factory, your IoC container won't be able to find a controller named "PersonController". Notice on line #5 above, we add a route constraint so that it will try to use the MVC route first as long as the first segment (where the "controller" token is positioned) is not the "Person" string which matches where we want our WCF REST service to be. If it is "Person", then it will fall through to the service route and correctly point to our WCF REST service. With the URL of "/Person/23", it correctly matches my service route for my WCF service. WCF REST and MVC are both great and they should be used together when appropriate.